Athena Fund Diamond Ratings help investors identify active equity mutual funds that demonstrate behavioral factors which are leading indicators of performance. Funds eligible to be rated include US domiciled active US and international equity mutual funds. Ratings are calculated each month and depend on the investment strategy being pursued by the fund, the consistency of that pursuit, and the conviction demonstrated by the construction of the resulting portfolio. Based on this criteria, funds are assigned a score of DR1 to DR5, with DR5 representing the highest rating. Athena believes that behavioral factors such as Strategy, Consistency, and Conviction are better leading indicators of outperforming active equity mutual funds than traditional approaches such as past performance. 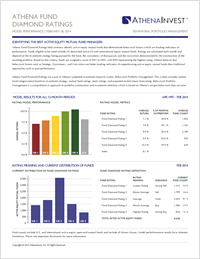 For current information on Fund Diamond Rating model performance and distribution, download the Fund Rating Summary on the right side of this page. For greater detail about the construction and benefits of the Fund Diamond Rating methodology, please refer to the Academic Bibliography page.